The average tendency to commit crime. The critics of the Jews have always contended that the general standard of morality among the Jews was lower than that of their Christian neighbors, and their tendency toward crime therefore greater. Such a charge was made by Johann David Michaelis in his review of Dohm's apology for the Jews. Michaelis says that while the Jews form only one-twenty-fifth of the population of Prussia, they furnish one-half of the criminals ("Orientalische und Exegetische Bibliothek," 1775-1785, xix. 7). This statement is false in every respect. The Jews, even now, after the partition of Poland, form only 1 per cent of the population of Germany. Further, David Friedländer has proved from official records that in 1789, in Prussia, of 1,703 criminal convictions only 22 were of Jews. Still Friedländer did not draw the conclusion that Jews were better men than the Christians; he merely contended that in order to judge the moral status of a community other conditions, such as occupation, education, and the political situation of the country, must be taken into consideration. The difficulties which beset an unprejudiced scientific examination into the figures on which the charge of criminality is based are manifold. First, owing to the numerical insignificance of the Jews, any investigation should extend over a long period of years and over a considerable area. It is known, for instance, that, at a certain time, in the two penitentiaries of the grandduchy of Hesse there were, among 600 convicts, only 5 Jews, while, supposing them to be as criminally disposed as their neighbors, they should have had about 25 repserentatives in the penitentiary ("Mittheilungen des Vereins zur Abwehr des Antisemitismus," 1896, p. 44), it is wrong, however, to draw favorable conclusions from these figures, for the statistics may have been different a few weeks later. It would also be unfair to point to the fact that, among the 45 persons convicted in Germany between 1882 and 1892 for infringement of the navigation laws, there was not one Jew, and that, during the same period, only 12 Jews were punished for malfeasance in office, while their proportionate representation should have been 73 offenders of this class. The facts are that few Jews are seamen, and they do not very frequently hold public office in Prussia. Similarly it would be misleading to speak of a lower standard of morality among Jews because they have, during the period 1882-92, furnished 191 cases of fraudulent bankruptcy, when their pro rata would have been 20, and 1,116 cases of bankruptcy, when their pro rata would have been 69. These figures do not prove that a Jew is ten and twenty times more apt to become bankrupt, because they must be compared with the number of Jewish and of Christian merchants, before a conclusion can be arrived at. In fact, while the Jews form only 1 per cent of the population, over 16 per cent are merchants. The number of Jewish criminals in Germany appears to be larger than it is, as Jews who evade military service are included in the total. As a matter of fact, however, this is due to emigration, which is of greater moment to Jewish young men to whom the avenues of public offices are closed. If this class of offenders be deducted, the proportion of criminality will be found much smaller. The greatest difficulty in the way of a thorough study of the subject consists in the fact that statistical material is incomplete, both geographically and chronologically. Few countries furnish complete statistics, and none go back further than a fewyears. 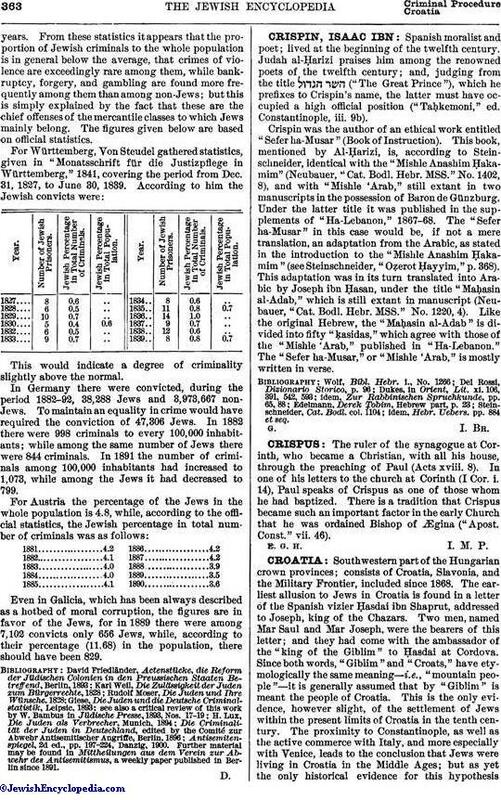 From these statistics it appears that the proportion of Jewish criminals to the whole population is in general below the average, that crimes of violence are exceedingly rare among them, while bankruptcy, forgery, and gambling are found more frequently among them than among non-Jews; but this is simply explained by the fact that these are the chief offenses of the mercantile classes to which Jews mainly belong. The figures given below are based on official statistics. Jewish Percentage in Total Number of Criminals. Jewish Percentage in Total Population. This would indicate a degree of criminality slightly above the normal. In Germany there were convicted, during the period 1882-92, 38,288 Jews and 3,973,667 non-Jews. 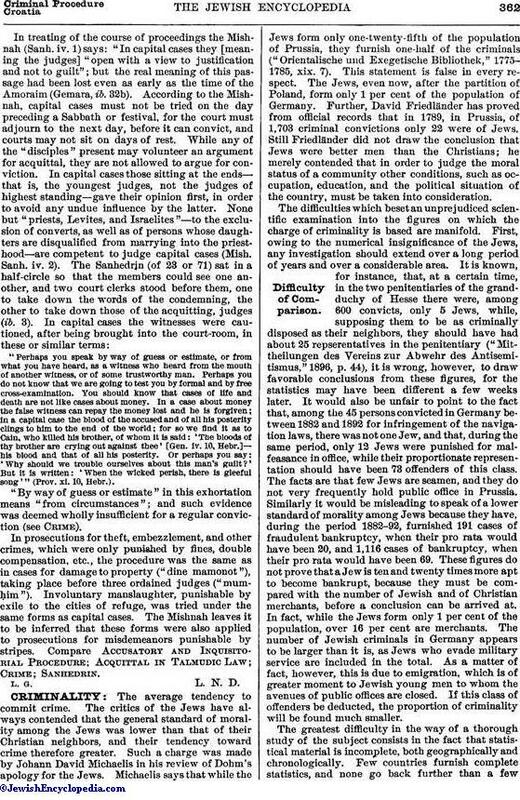 To maintain an equality in crime would have required the conviction of 47,306 Jews. In 1882 there were 998 criminals to every 100,000 inhabitants; while among the same number of Jews there were 844 criminals. In 1891 the number of criminals among 100,000 inhabitants had increased to 1,073, while among the Jews it had decreased to 799. Even in Galicia, which has been always described as a hotbed of moral corruption, the figures are in favor of the Jews, for in 1889 there were among 7,102 convicts only 656 Jews, while, according to their percentage (11.68) in the population, there should have been 829. Antisemitenspiegel, 2d ed., pp. 197-224, Danzig, 1900. Further material may be found in Mittheilungen aus dem Verein zur Abwehr des Antisemitismus, a weekly paper published in Berlin since 1891.